The students have already been exposed to various bloc coding platforms in their technology classes. Incorporating the drones just takes it a step further by allowing them to see their code run in flight. Students are able to perform various tasks and challenges with the drones. In the future, they will engineer obstacles for drone races. “Not only are drones fun to fly, but they can be used for many real life purposes. I want my students to be able to make real world connections in learning to use this technology,” said Technology Education teacher, Nicole Hill. Drones are used in many ways including real estate, surveying, security, delivery, wildlife conservation, farming, firefighting, and rescue. 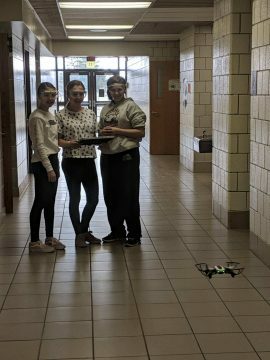 With this project, students will learn to fly the drones for a purpose and learn to program them to fly through specific steps. Many industries will need a talented workforce of trained and qualified technicians and operators in the future and this initiative gives students an opportunity to explore and learn of possible career paths.